Pineapple cocktails are among the fruitiest drinks you can mix up. While the Piña Colada is the best-known of all of them, this tropical fruit can be used in many equally delicious drink recipes. Pineapple juice is an essential mixer for a well-stocked bar and it's the easiest way to add the fruit to cocktails. Some of these recipes use the fresh fruit or homemade pineapple ingredients. It's a fun collection and you're sure to find some new favorites for ​you cocktail routine. 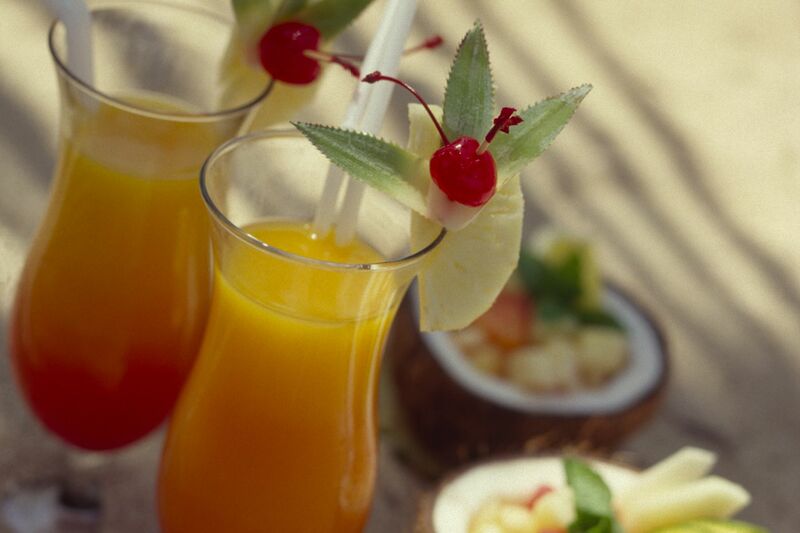 Pineapple juice is a key ingredient in many tropical cocktails. One of the best among them is the Bahama Mama and it remains one of our favorites. This timeless recipe pairs two bold rums with coffee and coconut liqueurs. Add to that lemon juice and a healthy dose of pineapple and you're ready for a day on the beach (even if it's just in your imagination). Also among the icons of the tiki bar, there are many recipes for the painkiller. It happens often with this style of drinks because everyone tries to guess what's inside and tiki bartenders like to keep their secrets. This particular painkiller recipe is a simple and common one. You'll need a navy or dark rum, cream of coconut, and orange juice. The pineapple juice makes up most of the drink, which is why we love it in summer. This cocktail is fun on so many fronts and it all begins with the name. Really, can you resist mixing up a drink that's a tongue twister like Yaka Hula Hickey Dula? You get bonus points for knowing the Hawaiian song. The recipe is incredibly simple and absolutely delicious. Think of it as a Hawaiian-style rum martini and you'll never forget it. Just pour equal parts dark rum, dry vermouth, and pineapple juice, shake, and enjoy. The French martini is a star on the modern martini menu and it's hard to find a cocktail lounge that can't make one. Also, it may not look like it, but there is indeed a nice dose of pineapple inside. The appeal of this popular cocktail is the contrast between ​the sweet black raspberry flavor of Chambord and the sweet-tart taste of pineapple. It's your choice between gin and vodka, just make sure to pick a good one. We'll throw a whiskey twist into your rum martini world and you have to taste this one to really understand what a marvel it is. The Algonquin cocktail is a true classic and it still tastes great. This recipe also pairs dry vermouth with pineapple, giving your taste buds a sweet-dry profile to enjoy. Behind that lurks the bold taste of rye whiskey. With today's strong rye market, there's no better time to try it. With the array of fascinating gins available today, the potential for making a great Park Avenue cocktail is the best it's ever been. This is, essentially, a perfect martini with a hint of pineapple and it's fantastic. You can opt for a traditional London dry gin or try out one of the newer styles like Hendrick's or Aviation. Each will create a completely different cocktail, giving gin lovers a new experience with every round. When you're ready to take the Park Avenue to the next level, turn to the Honolulu cocktail. It skips the vermouth but adds a whole lot more to create a very interesting drink. For this recipe, you'll pour your favorite gin, add pineapple, orange, and lemon juices, then sweeten it with a hint of syrup. ​Don't forget the bitters because they bring the mix into balance, leaving you with a tasty sipper. Ready to be tempted by a piece of pie in a glass? You won't want to miss the key lime pie martini. It's sweet, tangy, and will wake up all your senses. The recipe begins with a vanilla vodka background. On top of that, you'll layer triple sec, pineapple, and a sweet lime cordial. It's as close to its namesake dessert as you can get in liquid form and ​the graham cracker rim sets it over the top. Naturally, pineapple is going to make an appearance in a margarita or two. The Hawaiian margarita is a very fun recipe and perfect for a hot summer day when you want to chill out with the coldest, fruitiest cocktail possible. Tequila is required, of course, as is triple sec. With that margarita foundation in place, simply add fresh strawberries and pineapple, a hint of sour, then blend away. Should you find yourself in the mood for a more memorable margarita, try this recipe that pairs pineapple with a great spice. It's incredibly easy to mix up and there's no blender required. To make the pineapple chili margarita, you'll need a decent tequila, Cointreau, and lime and pineapple juices. It seems innocent enough until you add a dash of Tabasco habanero sauce. Only then does this spicy cocktail really comes to life. If the tamarind margarita has not been on your radar, consider it an absolute necessity, especially if you love tequila. The two flavors are natural companions and your tequila experience is not complete without it. To throw a twist into the mix, we'll add pineapple for the tamarind-pineapple margarita recipe. It's a frozen cocktail and requires just a few ingredients. To complete it, be sure to add a cinnamon or chili powder rim. A quick, refreshing drink is just moments away and everyone can appreciate this favorite bar drink. The surfer on acid is a bit of a cryptic name, but the cocktail is one you'll fall in love with. The beauty of this recipe is in its simplicity: coconut rum, Jagermeister, and pineapple juice. Pour equal parts of each over ice and enjoy. It's just as easy as a rum and Coke, just with a lighter profile and tastier flavor. The Pearl Harbor is another longtime favorite and it's a great choice for happy hour. This casual vodka highball has great color and a fun, fruity taste that will have you mixing up the second round before the first is gone. The recipe requires just three ingredients, making it a fast one to mix up. You'll need ​a melon liqueur such as Midori and pineapple juice. Add your favorite vodka and you're ready to sit back and relax. For the pineappliest of all pineapple cocktails, the centennial punch takes the prize. It's a brilliant recipe that can serve a small crowd and it's a delight year-round. You'll begin by infusing an impressive whiskey with pineapple, then make a coriander-pineapple syrup. As the party nears, puree some pineapple and caramelize a few lemons. Put it all together and get ready to wow your guests. Are You Storing Your Vermouth Properly? Curacao, Triple Sec, Grand Marnier... Which to Choose?